Highly Detailed artists impression of the large main artwork as shown above on the back of this Tee. The front of the Tee, located on the left side of the chest we have displayed the ‘Chevrolet’ bowtie badge emblem in blues and white with black outlines, with the script below this artwork, “Trucks ’67 - ‘72” as shown above. The artwork is of the second generation Chevy pickup truck family, introduced by Chevrolet. Brilliant colours and the highest of details will grab your attention here folks. 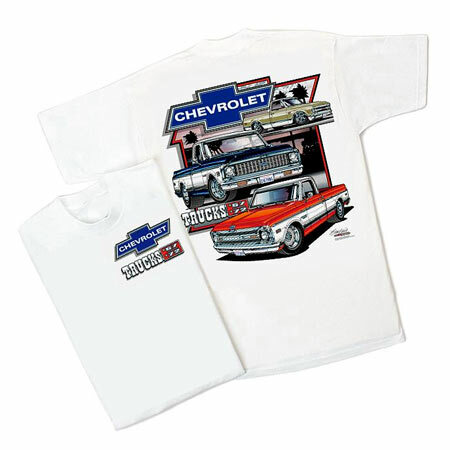 The artwork on the front of the Tee is of three Chevy Trucks, the first being the red and white 1967 CST/10 with those figure hugging “Mickey Thompson Sports” tyres tucked underneath the bed. Brilliant attention to detail here with colour, badge emblem details and factory steel wheel details (with some modification for the rears) with dress rims. The second beauty of this fine line up is this magnificent black and white 1972 Cheyenne/10 pickup Truck. Brilliant attention to detail, with bright colours used for that street neat look. This baby has plenty of polished chrome to stand out! Lastly, we have here this beautiful example of a 1968 C10 pickup truck in gold and white combination. Big tyres, dropped to the ground stance and plenty of polished ‘bling’ makes this gorgeous ride a real head turner! In the background we have an illustration of palm trees within a dusk setting. The main script above the main artwork is of the Chevrolet bowtie badge emblem as clearly seen on the front of these magnificent trucks. Nearing the lower section of the main artwork we have the script “Trucks ’67 – ‘72” Tee shirt Colour: Available in White only, with genuine GM Official Licensed Product Tag.